To support holding the 2017 joint BEMS-SEERS meeting in Myrtle Beach, the Organizing Committee has established a number of suggested sponsor and exhibitor contribution opportunities. However, a commitment in any amount is appreciated and will be acknowledged appropriately and applied to defray expenses directly associated with holding the joint meeting. Both society meetings are supported solely from participant registration fees and solicited contributions. All funds received will be applied directly to logistical expenses associated with the 2017 joint meeting, with all efforts made to reduce costs to facilitate both graduate and undergraduate student attendance (traditionally >> 50% of participants). Your contribution will be applied directly to keeping student expenses as low as fiscally possible while providing a professional and congenial setting to encourage open scientific exchanges. Ample display space directly connected to the meeting rooms is available at the Myrtle Beach Sheraton Convention Center (also see below) where the joint meeting will be held. Suggested contribution levels are below, but we gratefully will acknowledge any level of support. Please support the 2017 joint BEMS-SEERS meeting. Over its 40+ year history the Benthic Ecology Meeting has become one of the premier venues for sharing cutting-edge marine ecology research and for students, future professionals, to receive vital feedback and participate in career critical networking. To discussion sponsorship and exhibitor opportunities please fill out the form at the bottom of this page and a member of the BEMS-SEERS Organizing Committee will contact you. Thank you for your consideration! 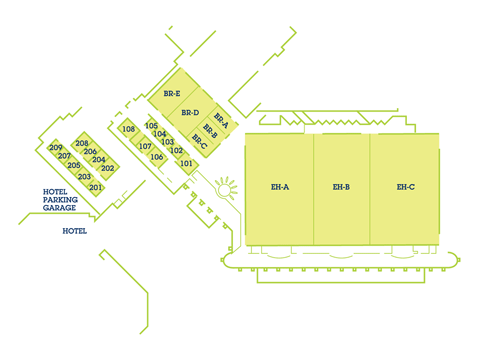 Area between ballroom and exhibit rooms available for displays. Stairs/elevator to second floor meeting rooms ascends from area.